New SCSM 2017 Routes to Showcase Iconic Singapore Landmarks Past and Present | JustRunLah! 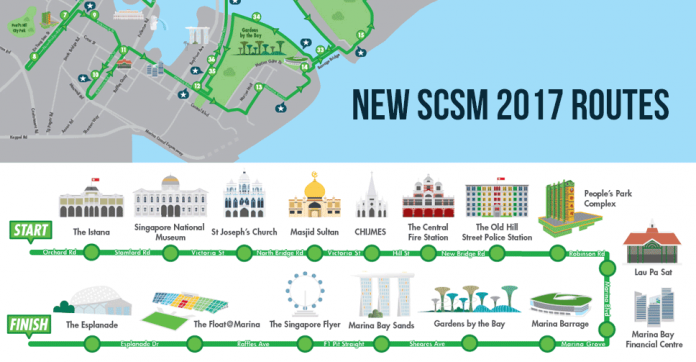 Organisers of the Standard Chartered Singapore Marathon 2017 (SCSM 2017) announced new “heritage” routes and entertainment points for race day on 3rd December. The new routes will allow runners to enjoy a historic cultural journey through Singapore as they race past Little India en route to iconic heritage sites in Chinatown, the Malay Heritage area, and city centre before being flanked by towering glass structures in the Central Business District. In addition to the new sights and sounds, runners can also look forward to an improved, safer race experience with full road closures across over 90% of the route – the most ever of any race in Singapore. Beginning from Orchard Road, runners in the Full and Half Marathon category will race through Singapore’s shopping district before turning left towards Bugis, Rochor and the Arab Street enclave– new features on this year’s routes. In the heritage stretch, runners will race pass the National Museum of Singapore, the iconic Masjid Sultan Mosque, OId Hill Street Police Station, and traditional shophouses on their way to bustling Chinatown and the newly developed Downtown Core – the economic heart of Singapore. After sharing 12km, the runners split at Marina Green, with half marathoners making the u-turn towards Marina Bay Sands, while full marathon participants advance into the spectacular lush-urban Gardens by the Bay. An addition to the route this year, the 5km loop which passes through Gardens by the Bay, reduces the time spent along East Coast Parkway, making for wider pathways and more room for overtaking. 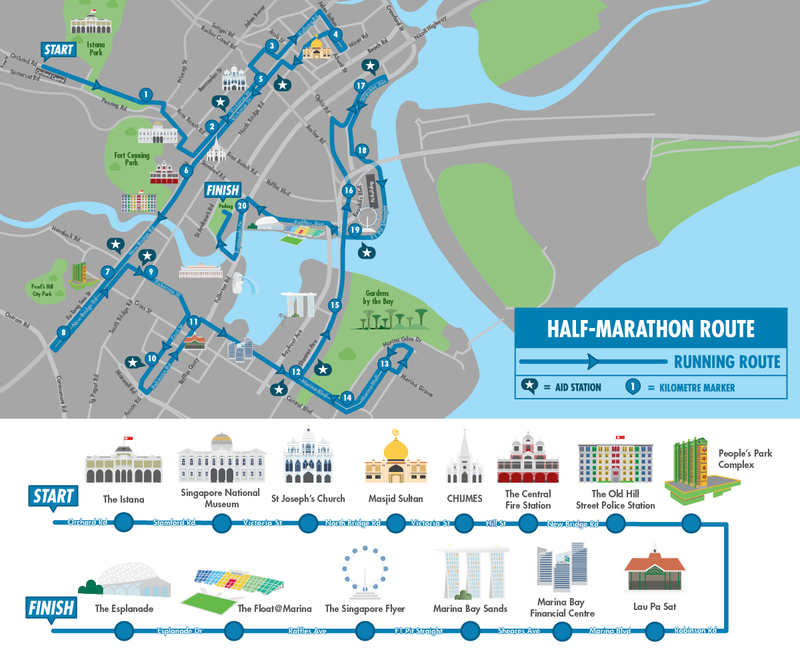 For the first time, over 90% of the route will see full road closure this year to align with World Marathon Majors standards and offer a better car-free experience to runners. 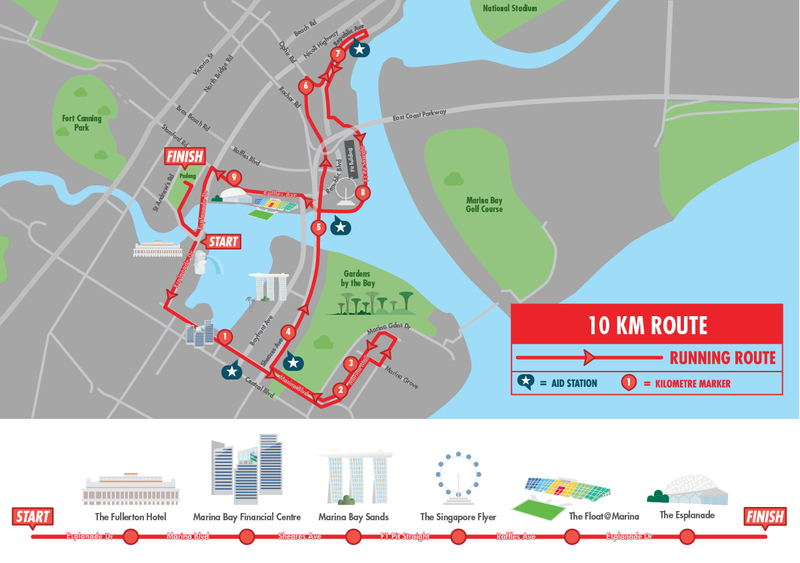 The 10km category will flag off outside One Fullerton, with a picturesque backdrop of the Central Business District. 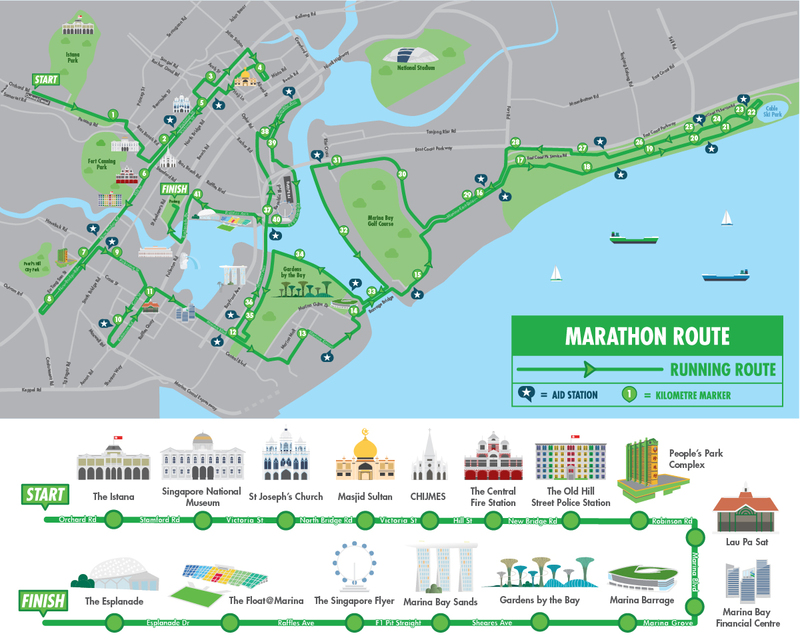 The route will take runners southward, passing through the Downtown Core before looping back onto the reclaimed Marina Bay. At the 35km mark, half and full marathon runners will merge to run the penultimate 5km of the race together before splitting into respective lanes 2km from the end. The split will allow faster runners in the marathon category a smooth finish on their final approach towards the all new finish line on the Padang. The new centralized finish line is designed to cultivate a spectator-friendly atmosphere allowing friends, family and loved ones to line the route and welcome runners on the home stretch. Building on the race’s best practices from 2016, both the Half and Full marathons will have an hour-long flag-off beginning simultaneously at 4:30am, while runners in the 10km category will start at 7:15am. Runners in the Half and Full marathons will be divided into five main pens, based on runners’ pace. This year, the pens will feature additional entrances to facilitate easy access for runners at all times. Register for SCSM 2017 at www.singaporemarathon.com. Going to SCSM2017? Add it to your runner’s profile! JustRaceLah! 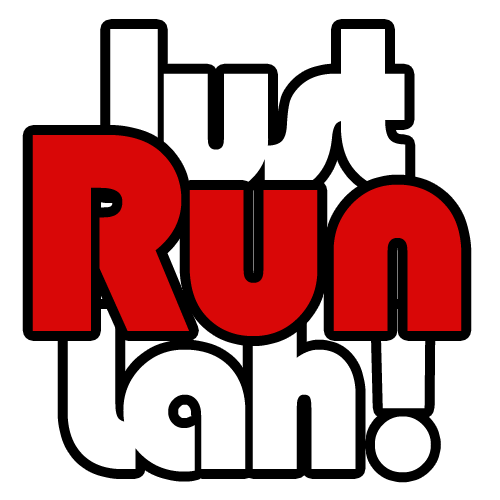 is the app for all runners and active individuals who enjoy taking part in marathons and road races in Asia – Pacific. Download the app now – Free for iOS / Android.